﻿Cinco De Mayo: Calendar, History, Tweets, Facts, Quotes & Activities. 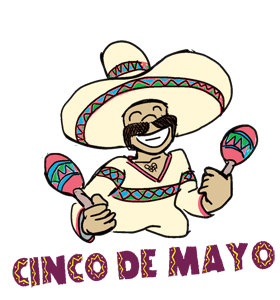 Cinco de Mayo is a celebration of the Mexican Army's victory over France during the Franco-Mexican War. During Mexico's war with France, the US was engaged in its Civil War. Cinco de Mayo celebrates the Mexican victory at the Battle of Puebla. This battle was a significant turning point for the US as well. The French were US Confederate Army supporters. During the Battle of Puebla, their attention became so focused on the battle with Mexico that the US Union Army forces were able to advance and gain significant ground. It is considered a minor holiday inside Mexico however, in the US, Cinco de Mayo not only celebrates the victory at the Battle of Puebla, but also serves as a celebration of the culture and heritage of the Mexican people. According to the 2011 Census, there are 33.6 million US residents who claim Mexican origin. Over 60% of US residents claiming Mexican origin live in either California or Texas. Cinco de Mayo literally means 5th of May. In 2012, Mexico was the third largest trade partner with the US, with over $494 billion traded. Attend a Cinco de Mayo Festival. Popular such festivals can be found in San Antonio, Los Angeles, Chicago and Houston. Go eat or have drinks at a Mexican restaurant. Make Margaritas with Mexican tequila. Make a piñata with your friends. Piñatas usually contain sweets or treats that fall out once it has been smashed open.